Repairs have begun on the section of the Forsyth Big Creek Greenway between Mcfarland Parkway and Union Hill. Additional flooding and rain delayed the start of repairs to the damaged section of boardwalk. The repairs are estimated at being completed on Monday May 9th, weather permitting. Also the Bethelview entrance to the trail was closed today, 4/26, due to a tree blocking the trail. Crews are out removing the tree, and that portion should re-open tomorrow, 4/27. Could you please let me know how much the Big Creek Greenway cost, and how long it took to construct? Was it paid for entirely by Forsyth County taxpayers? If not, what was Forsyth County’s share? Was any thought given to putting the construction on hold during the economic downturn, while tax and other revenues were low? How much did the repairs cost? I don’t mean to be a grouch, but we’ve lived in Forsyth County and paid taxes here for 15 years, are struggling to hold onto what we have and that makes you look at life differently. Since the trail near our house goes through the wetlands, how is it that flooding was not accounted for in the plans? As for flooding, it was accounted for in construction. 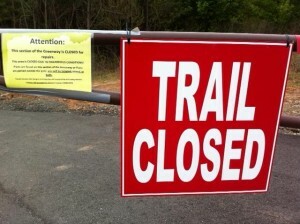 The major damage that is being repaired is due to misuse of the trail. Apparently someone decided it would be convenient to drive their off-road vehicles on the boardwalk north of McFarland. This does not surprise me, since before the Greenway was built, this area was known for taking trucks off-road on the old utility trails after a rain.